Former Today host and NBC news anchor Matt Lauer, who was fired from the network on Wednesday following allegations of "inappropriate sexual behavior in the workplace," issued a statement this morning regarding his misconduct. “There are no words to express my sorrow and regret for the pain I have caused others by words and actions," wrote Lauer in his statement, which Today anchor Savannah Guthrie shared with viewers on Thursday's show. "To the people I have hurt, I am truly sorry. As I am writing this I realize the depth of the damage and disappointment I have left behind at home and at NBC. Some of what is being said about me is untrue or mischaracterized, but there is enough truth in these stories to make me feel embarrassed and ashamed." He went on to write, "I regret that my shame is now shared by the people I cherish dearly. Repairing the damage will take a lot of time and soul searching and I’m committed to beginning that effort. It is now my full time job. The last two days have forced me to take a very hard look at my own troubling flaws. It’s been humbling. I am blessed to be surrounded by the people I love. I thank them for their patience and grace. You can watch a clip of Guthrie reading the statement below. 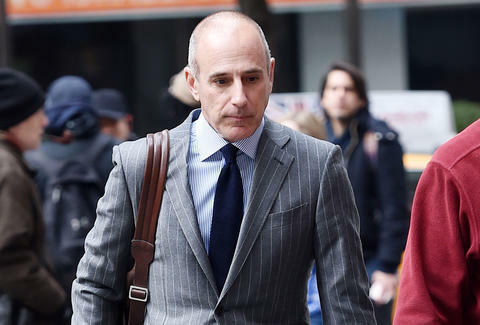 According to Variety, Lauer's firing occurred on Wednesday morning after NBC News received a detailed complaint on Monday night from a fellow NBC employee about the anchor. According to the accusation, inappropriate sexual behavior had transpired during a trip at the Sochi Olympics in 2014 and continued for months. In a statement, NBC News Chairman Andy Lack described his conduct as a "clear violation of our company's standards." He went on to write "while it is the first complaint about his behavior in the over twenty years he's been at NBC News, we were also presented with reason to believe this may not have been an isolated incident." Following Lauer's firing, both Variety and the New York Times published reports that described a pattern of behavior of manipulation, coercion, and harassment. The Times story included the news that NBC received two additional complaints regarding Lauer on Wednesday after the initial story broke. "One complaint came from a former employee who said Mr. Lauer had summoned her to his office in 2001, locked the door and sexually assaulted her," wrote the Times. The Variety story also included details about how Lauer, one of the most powerful and highly paid figures in the often cutthroat morning news landscape, had an office "in a secluded space" and how he had "a button under his desk that allowed him to lock his door from the inside without getting up." Lauer celebrated his 20th year as the host of Today earlier this year. He got his start on the program in 1997, in the midst of the show's impressive 852 consecutive week period of ratings dominance over its morning news competitors. The show has been increasingly mired in controversy and tabloid stories over the last few years after ABC's Good Morning America bested it in the ratings in 2012. Along with Charlie Rose of CBS This Morning, who was fired following the publication of a bombshell story in the Washington Post, Lauer is the latest television news fixture to be accused of sexual misconduct following the sexual harassment and assault allegations against Hollywood producer Harvey Weinstein earlier this fall.